The book starts in the late nineteenth century and runs to our present era. It discusses the evolution of the newspaper industry, the first appearance of colorful and commercial billboards in Paris, the birth and development of the radio industry, the advent of television, then computers, then cell phones, and touches briefly on our likely adoption of wearable technologies and virtual reality. By the 1830s, where Tim Wu begins his book, newspapers were largely a luxury of the rich. At the then price of 6 cents per copy (they cost about 5 cents to produce), it was largely out of the price range of the common man. But 23-year-old Benjamin Day, a print shop proprietor who once worked for a newspaper publisher, tried something unheard of in 1833. He decided to price his newspaper at a penny per copy, and in doing so, make it available to far greater audiences. But, in order to keep his New York Sun publication afloat, he had to have another source of revenue. He became the first news publisher to sell advertisements in the newspaper. In order to attract more readers, Day sought to publish stories that readers found interesting, and often times this included reports from New York’s police court. Day even hired a man, George Wisner, at $4 per week to cover the court, and in doing so, quite possibly created “the first full-time news reporter in U.S. history.” Within his first year of operation, Day had succeeded in attaining enough readers (perhaps 5,000 per day by the end of 1834), to sell enough advertisements to make the operation profitable. Other competitors were quick to enter the marketplace, including The New York Transcript, which focused largely on sports coverage, and The Morning Herald (also known as The New York Herald), first published in 1835. The New York Herald, headed by a James Gordon Bennett who was loud and boastful and publicly attacked competitive papers in an attempt to draw attention to his own, gave the New York Sun its biggest challenge for readership. By some accounts, both papers had approximately 7,000 daily readers each by 1836. What is noteworthy about these papers’ business models is that they had turned the consumer, the newspaper reader, into the product – a pool of potential customers that the advertisers were willing to pay to gain access to in the hopes of persuading them to purchase their goods and services. And, since the newspapers had to continue to find ways to keep these, and increasing numbers of customers, coming back for more, they had to give the readers more of what they wanted. And this frequently entailed appealing to “the audience’s baser instincts.” Initial coverage of police court turned to sensational coverage of murders, and soon truth and facts were casualties in the quest for readership as the Sun ran a five-part series on how a famous scientist, Sir John Herschel, had moved to the Cape of Good Hope, built a powerful new telescope, and as the Sun reported, “…has obtained a distinct view of objects in the moon,” particularly “large, winged creatures which when not borne aloft could pass for human.” The story became a popular serial among the readers, and had not a shred of truth to it. Within the first 20 pages of Tim Wu’s book, back in the late 19th century, I felt as if the discussion of the newspaper industry had beautifully foreshadowed much that would come after, and a lot of what I have seen in my own lifetime. The New York Transcript’s focus on sports was, as Wu pointed out, a kind of precursor to today’s ESPN cable channel. The Sun’s and The Herald’s fight for viewers with coverage of violent crime, murders, suicides and other sensationalist claims have echoes in our evening broadcast news programs, crime drama shows like Criminal Minds and CSI, and publications like The National Inquirer. And the concept of giving something away for free or at very little cost (such a penny paper), with the goal of monetizing that investment later in the form of advertising and/or subsequent purchases, explains how virtually all of the apps I’ve downloaded made their way to my Apple iPad and Android phone. Yeah, I guess it’s true. The more things change, the more they stay the same. The show became so popular that, by 1931, approximately 40 million, and for some episodes as many as 50 million people, out of a population of 122 million, were tuning in to hear Amos ‘n’ Andy. “It was a result unprecedented for any entertainment product, the equivalent of having today’s Super Bowl audiences each and every evening – and with just one advertiser.” In turn, Pepsodent took the opportunity to expose its audience to a much longer advertisement message, with a more hard-sell approach akin to how snake oil remedies where hawked a few of decades earlier. The wireless radio had the power and reach to influence a great number of people at great distances, unlike any invention ever before it. In fact, although it was not proven true by any scientific measure at the time, advertising agencies stated that they could very effectively persuade consumer behavior via radio’s auditory signals because the human being is conditioned to respond to spoken commands. The line between “propaganda” and commercial advertising is very thin one. Just as Hitler and Churchill had good cause to motivate and direct the thoughts of their citizens toward political and national causes, advertising agencies like McCann Erickson, conditioned our thoughts to have warm and positive associations with products they promoted. To illustrate this crossover, consider that Edward Bernays, nephew of Sigmund Freud, who applied Freud’s theories toward manipulating human behavior for the benefit of his commercial clients as an advertising consultant, not only wrote a book entitled Propaganda but also was hired by the CBS radio network as a consultant in the 1930s. This was the golden era of television viewership, from the standpoint of the advertisers, where viewers had very few options and no remote control to quickly change frequencies. And, along the way, corporate-sponsored shows, where viewers received only one company’s message, gave way to fragmented clips by several companies interspersed throughout the show, which became the established way of advertising on TV and are still with us with today. Advertisers took increasing liberties with their viewers’ attention spans. “…Advertising spending quadrupled from 1950 through the 1960s, from $1.3 billion to $6 billion, or approximately $11.5 billion to $54 billion in present value.” After a period of time in the radio era where the advertising industry had floundered, “Advertising was back, ready to feed off of television’s bountiful harvest of America’s attention. It must have seemed only fair, since every other business was doing the same.” We were sold Cadillacs, Marlboro and Lucky Strike cigarettes, Oscar Mayer wieners and Kellogg’s cereals, among other things. During the daytime, housewives viewed commercials for laundry detergent and other household products. Just as with newspapers and radio before, everything in the television sphere was done to place us, the audience, before the advertising corporations, and for a price. And, that price rose as the audience grew. We were the product, and the large corporations were the customer. CBS and NBC didn’t compete to offer the best entertainment programming for the sake of being artists delivering great performances to the masses. They did it to make money. And how they made money was by reselling our attention to the large corporations willing to pay for it. Our attention meant more sales of Cadillacs, Marlboros, Lucky Strikes, Oscar Mayers, Fruit Loops and Tide. All that I’ve just summarized represents a small portion of Tim Wu’s book. He goes on to discuss the advertising industry’s more challenged forays into the new realm of the Internet, where initial revenue from banner advertisements ultimately evolved to tracking cookies and demographic profiles built on users. “In this game of trackers and profile builders, as in so many others, Google and Facebook… reigned supreme. By design, both firms had acquired the best data on just about every consumer on earth, as well as possessing the best tools for collecting more of it, which by the 2010s both were prepared to exploit as far as possible.” The model of giving things away for free, especially free apps like Angry Birds and Candy Crush, not to mentioned the very addictive free personal email account, with the goal of making money off of “unique users” and their “page views,” harkens back to the era where Benjamin Day sold his penny paper far below cost with the intent of making money off the reader base in other ways. As we become increasingly aware of the value of our attention, it seems logical that “the rich or tech-savyy cord-cutters… [increasingly watch] commercial-free television on Netflix or Amazon, read eBooks or browse the web on an ad-blocked phone or computer.” The millennium generation has a “growing distaste for advertising and unprecedented willingness to pay for peace and quiet.” “As Michael Wolff points out, television, as a whole, [is] now reliant on subscription charges for 50 percent of its revenue, an unheard-of portion.” But, before you get too excited that this demonstrates we’ve come to our senses and society is eschewing the tired, commercial model, recall that we’ve been here before, several times. Through all of the uncertain transitions from newspapers to radio to television and to the Internet, the advertising industry has been “left for dead at least four separate times over the past hundred years. Again and again, it has seemed as if the party was over, that consumers had fled once and for all, and yet the attention merchants have always found a way to overgrow the bright new machines that seemed to be hacking their way through the old-growth foliage.” And, given the highly addictive nature of the new technologies they get to play with, such as the consumer’s need to check email, get social media updates, satisfy their curiosity when confronted with a juicy “clickbait” headline, or just while away some boredom on a subway car or in a dentist’s waiting room, the attention merchants seem to have little difficulty finding new ways to keep us hooked, for their benefit. “Free apps” and free television shows aren’t free. They come at a price. The price is your attention. Attention that could otherwise be devoted to family, friendship, personal development, exercise or the like, gets siphoned away, often in 30-seconds increments at a time, in the hopes that you’ll come to think more positively about the commercial products placed into your sphere of consciousness. 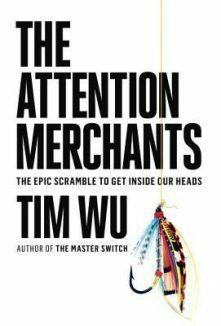 Tim Wu has written an excellent book. It is as much a review of the history and evolution of these various entertainment mediums as it is a review of the advertising industry which has operated within them. And his book covers so many more topics than the surface I’ve scratched here. I highly recommend this book if the topic is of interest to you.